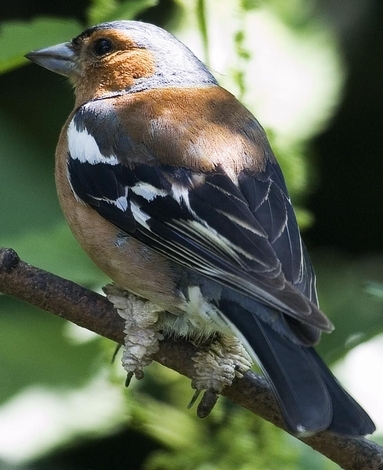 A number of people have contacted me regarding Chaffinches that they have seen with swellings and growths on their feet, and were interested to know what these were and how they affected the birds. A number of different agents may cause swellings on the legs and feet of wild birds. The three most common ones are mites, viruses and bacteria. Mites of the genus Knemidocoptes result in scaly legs. The 'scales' themselves are dry encrustations made up of material produced by the bird in response to the irritation caused by the mites, together with skin debris thrown up by the mites as they burrow into the tissues. As well as forming on the legs, the 'scales' may also form around the beak. These mites are members of a wider family of mites that cause mange in domestic animals and scabies in humans. The virus Fringilla papillomavirus causes warty growths. Chaffinches seem to be particularly prone to this. These growths may vary in size from small nodules to larger warts that engulf the whole leg. The growths have a similar structure to warts in mammals and are due to excessive growth of the keratinised layers of the skin. The warts develop slowly over a long period and affected individuals may otherwise appear quite healthy. 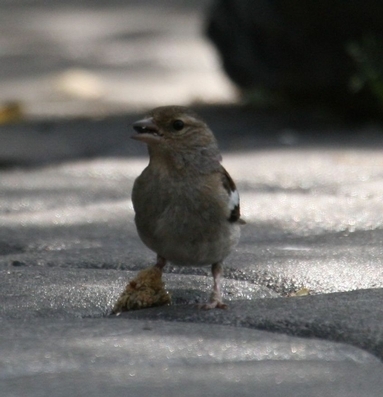 In a large survey of birds captured for ringing in the Netherlands, growths were found on 330 (1.3%) of some 25,000 chaffinches examined and both sexes were affected. However, cases usually occur in clusters and quite high proportions of local populations may be affected in outbreaks. Bacteria can also affect wounds on the feet, resulting in the formation of abscesses - sometimes referred to as 'bumblefoot'. In some birds you get combinations of all of these. While it seems unlikely that these diseases have a major impact on population densities, they do impact on the welfare of individual birds but this is variable. Birds with large growths often appear to behave normally, so the growths may be little more than an inconvenience or a relatively minor irritation. However, lameness is sometimes observed and this clearly indicates pain. Other birds lose affected digits. There is no treatment. The outcome of the disease is unclear. Birds may die through being incapacitated or through developing secondary infections but there is evidence from ringed birds that in some cases the growths regress. What can be done? The fact that cases occur in clusters suggests that the presence of affected birds presents a risk to others that are susceptible. The mode of transmission is not known but it seems likely that the “agents” may be spread via surfaces the birds stand or perch upon. If so, hygiene measures, such as cleaning your bird feeders and bird tables, may help to reduce the risk.